My son and I were on our way back from a music lesson, and talking about Vladimir Putin. He'd been the most recent topic of conversation, as we talked about the remains of a Malaysian Airliner, which still smoldered in a Ukrainian field. He was offering up his cynical explanation for those deaths, while Russian state-owned media spun out one obfuscating story after another. "So, here's a hard question for you," my younger teen said. "You're a pacifist, right? Let's say you suddenly get super powers. And you know that someone is taking actions that are going to get thousands and thousands of people killed. Do you use your powers to kill that person, and save thousands of lives? Or do you let them live, and let thousands of innocent people die?" I'm not a pacifist, of course, not entirely. But I also think that integrating violence into one's method for attaining justice is profoundly dangerous. So we talked, and as we bantered around the question, I found myself wondering something else. Just how does one deal--as a Christian--with those who wield power with cold eyes? Vladimir Putin has always struck me as just such a soul. And he has a soul, I think, despite Joe Biden's recent and entertaining statement to the contrary. Oh, Joe. I just can't take that route. Assuming a person is just an automaton, or that they're somehow no longer human, that's a very dangerous call to make. When we deny the soul of the other, we do so at the peril of our own. So yes, he does have a soul. It's just a very hard soul. 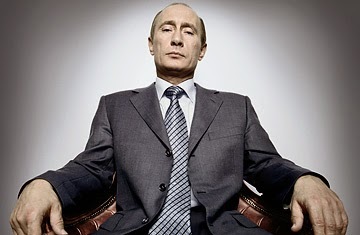 I cannot look at Vladimir Putin without seeing just how intelligent he is, how shrewd, how calculating. Here, a human being who understands the dynamics of power, and understands--from history and experience--how to use power to his advantage. That is his defining ethos. That is who he is. People who oppose Vladimir Putin die, or are imprisoned, or disappear. Support him, and you'll be rewarded, or permitted to profit from that support. Truth is immaterial, or, rather, it is known, but closely and cynically held. If it is an impediment, it will be bent and spun to the needs of power. He's a hard, hard man, leading a nation whose long history is filled with hard men. But how, I find myself wondering, do you theologically approach folks like Putin? Here, an individual whose identity--his whole self--is woven up with worldly power. And it has worked for him. Of what use are the teachings of Jesus to such a man? Oh, the church and institutional religion are undoubtedly very useful, as they have always been to kings and emperors and tzars. But the radical love of God and neighbor that is the heart of the Gospel? What conceivable appeal can they have to him? Though I know them to be true, I am reasonably sure that he would find that Way of being naive, weak, and childish. Just as I find his way of being wrought of the dark hubris of coercive power, and inherently self-annihilating. The final disposition of such a soul, of course, is not my call. This, as my conversation with my son reminded me, is a good thing.